Oak, Maple, Alder, Willow, Poplar, Apple, Hawthorn, Elm and Linden trees. However, many plants including some conifers are eaten. They consume foliage of many trees and shrubs. Gypsy moth overwinter in the egg stage in a buff-coloured egg mass laid on the tree and covered with a dense patch of hairs. Larvae hatch in late April to early May as Bradford Pear, Redbud and Amelanchier are blooming. Newly hatched larvae produce webs in order to disperse via wind to other hosts. Larval development takes about seven weeks and can be up to 6 cms long. Young larvae are dark with irregular yellow marking on their backs and a black head capsule. As larvae mature (four to six instars), they develop 5 pairs of blue spots and 6 pairs of red spots on their backs. 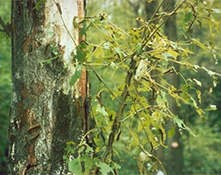 Moths pupate in protected sites, like under loose flaps of bark or on woodpiles. Adults emerge after pupation (about 10-14 days) beginning about mid-July to mate and lay eggs. Females are creamy white with a wingspan of about 2 inches; males are brown with darker bands. Females cannot fly,-they attract males with pheromones, mate and lay eggs near the pupation sites. Egg masses are laid in July to August. Look for and destroy egg masses in late summer and fall or before they hatch in Spring. Use approved insecticides to manage young larvae. (before the head capsule turns yellow). A folded burlap cloth wrapped around a tree provides a daytime shelter for larger larvae or pupae. Collect them from these shelters and destroy them. 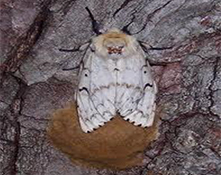 Pheromone traps can be used to time the emergence and flight of adult male Gypsy Moths. 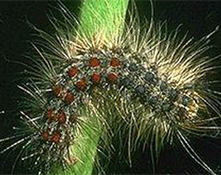 Gypsy Moths have many natural enemies, including predators, parasitoids and pathogens. NPV (a virus) may cause a significant drop in populations within a couple of years of an outbreak.